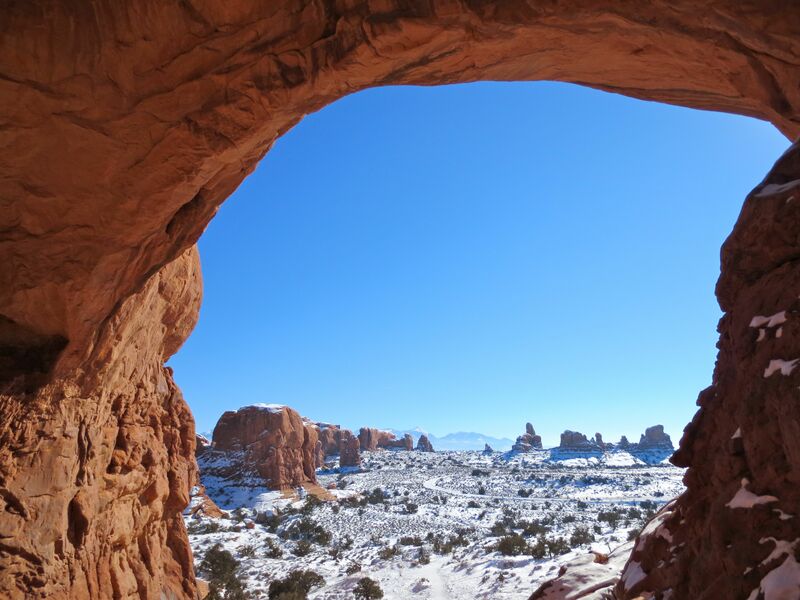 Arches National Park | Where is Yvette? There is something about a stretch of the American West that is unoccupied by anything but wilderness and your rental car that must surely make even the most unromantic among us wax poetic. Towering mountains! A ribbon of road and classic rock on the radio! Let’s go have an adventure! It’s a four hour drive from Salt Lake City to Moab so I wasn’t going to get any beautiful national park sightseeing along the way, but then I heard of a very interesting place called Sego Canyon that I just had to see. 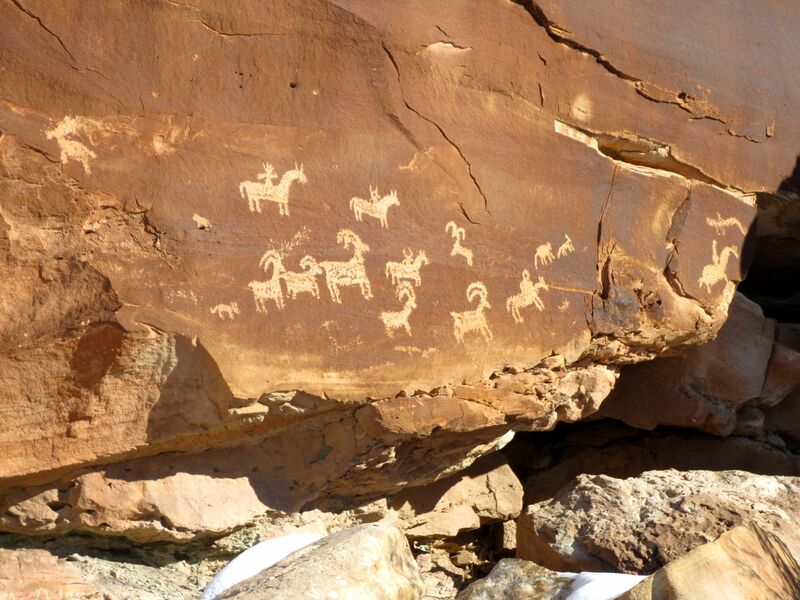 You see Sego Canyon is just off I-70 making it super easy to get to, and it contains not only pre-Columbian petroglyphs but also a ghost town abandoned in the 19th century. Call me odd but I don’t think I could ever understand someone who would pass that up. So after taking care to turn off I-70 at the Thompson Springs exit- hey, if you saw the “next services 110 miles” sign there you would too- I drove up Sego Canyon pictured above. Being snowy winter I never did make it to the ghost town- I’m sure a 4wd would have made it, but wasn’t about to test the rental- but the petroglyphs were certainly worth it! 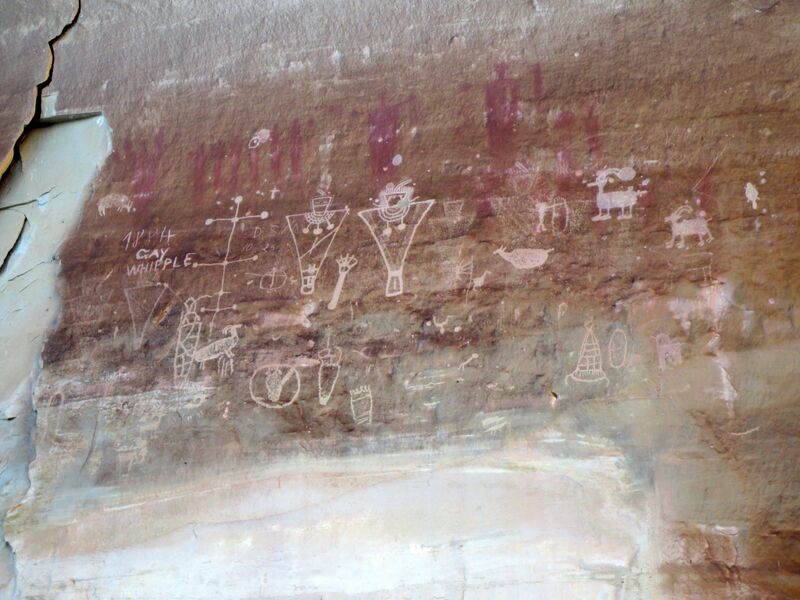 There are three main panels in Sego Canyon, all conveniently near each other and each attributed to different peoples. The oldest above also happens to be the biggest and best preserved one- it was made by the nomadic Archaic People who lived in Utah before agriculture, meaning 8000 B.C.-100 B.C., meaning this panel may well be older than the Egyptian pyramids. Say what?! As you may deduce from the creative name we don’t know much about the Archaic People, but based on the art style I’d guess they had a spiritual medicine man- type side in their culture and decent access to peyote. That or they met aliens, whichever’s more logical. 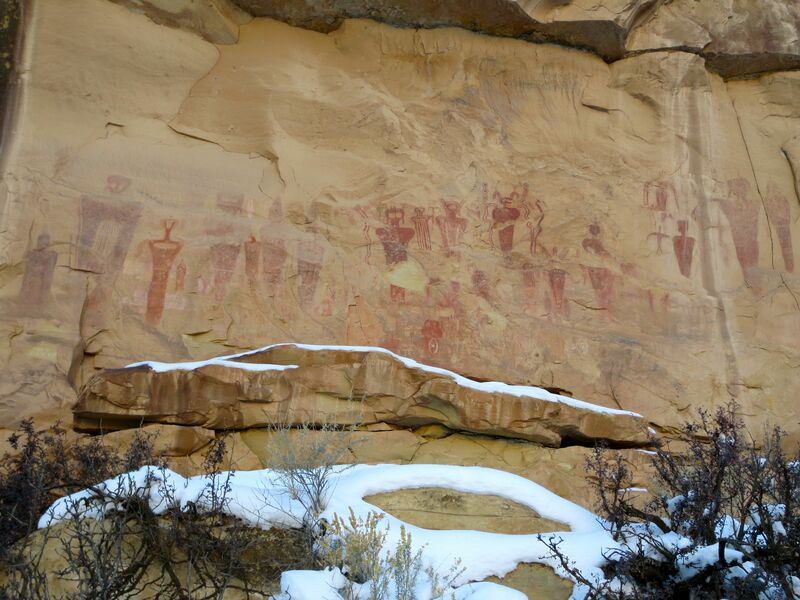 Next up was a panel from the Fremont Indians who were in the area from 600 A.D.- 1250 A.D., and were contemporaries with the more famous nearby Anasazis (though I guess these days you’re supposed to call them “Ancient Pueblo Peoples” according Wikipedia). What was interesting to me here is you can see that over the centuries the Fremont Indians kept painting and carving over older stuff on the same panel- the top reddish figures are the oldest and still look kinda similar to me to the Archaic Peoples one (though it’s not clear the first panel’s figures are way bigger- like larger than a person- these were a foot tall max) but then later generations of the Freemont Indians carved over the paintings. Oh, and a 19th century guy carved over that lest we forget that a lot of ancient petroglyph art is likely just old graffiti. This panel was made by the Ute Indians for whom the state of Utah is named after, who lived in the area from ~1300 A.D. until being forced onto reservations in 1880. The signboard here pegged the date to sometime in the 1700s, which makes sense when you see the Indians now have horses to ride. 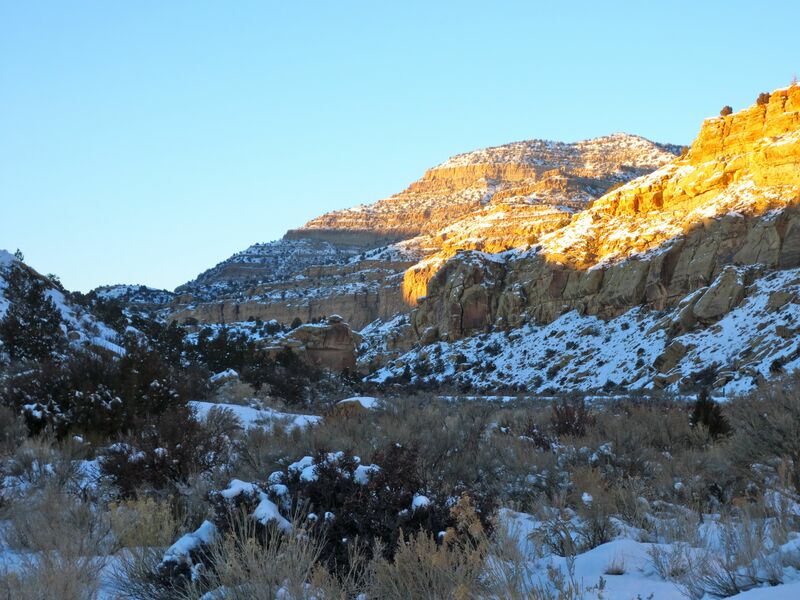 So all in all, I’d say the adventure to see some old Wild West history was a great success and I do recommend Sego Canyon to anyone passing through the area (though I hope I might do so someday again in summer to make it to the ghost town!). We always think of American history as something “new,” but there really are traces remaining from those who wandered here hundreds or even thousands of years ago. 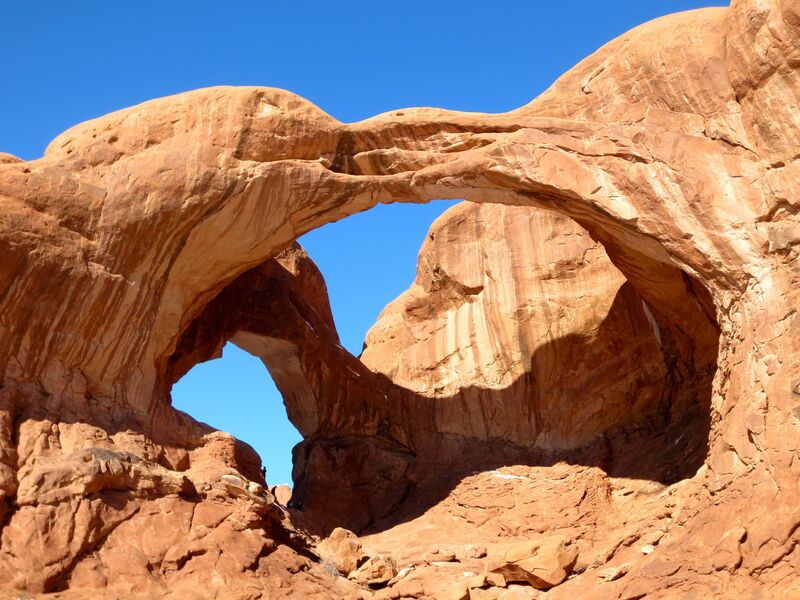 The other interesting thing to note here if you’re a geek like me is Double Arch was formed differently than most of the other arches in the park, which were primarily created through wind and water erosion from fins of sandstone. Instead these are what are called “pothole arches,” where a basin near a cliff face gets eroded away from the water captured within it. Which is very clearly something you can imagine after looking at the first picture. Go science! Posted in Arches National Park, Science! 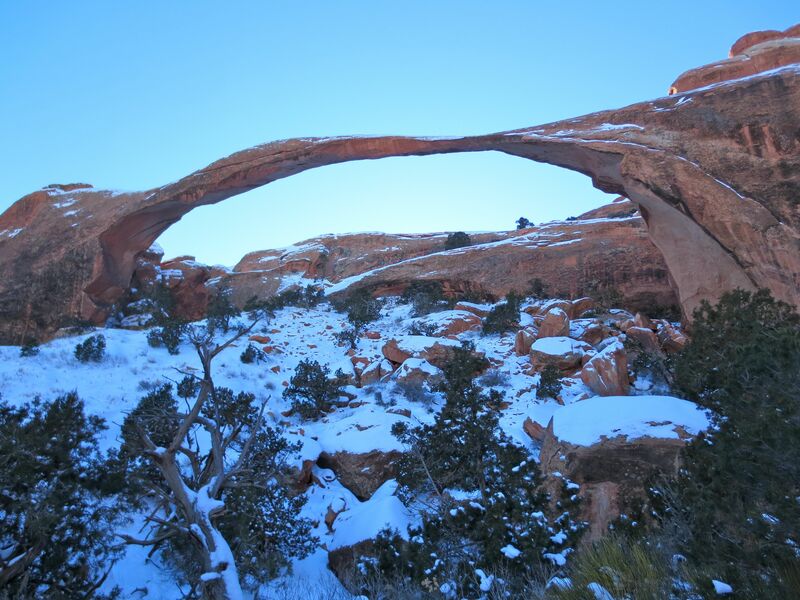 If you ask me, for reasons above I believe Landscape Arch should have its name changed to that of Delicate Arch unlike the famous one in the park because it certainly looks a lot more delicate if you ask me! 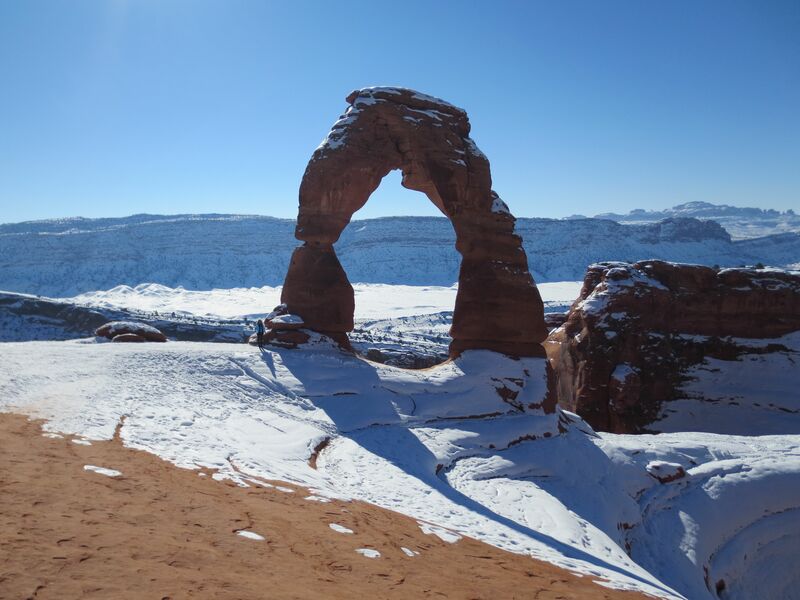 I have also further proposed that the current Delicate Arch be renamed to what the local cowboys called it- “The Schoolmarm’s Bloomers,” cause it really does look like that– but as is often the case in this tragic world no one listens to me. 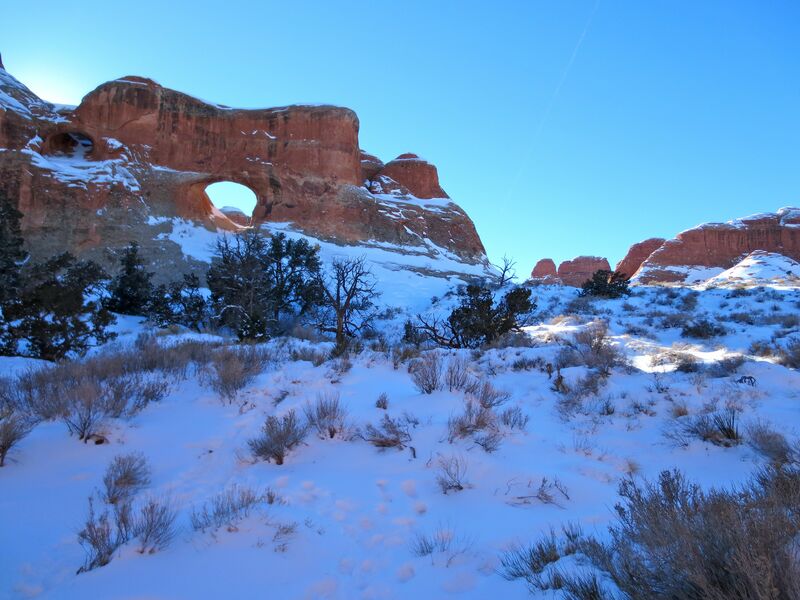 The trail continues after this point to another famous arch in particular, the “Double O Arch,” which is supposed to be quite nice but the trail isn’t as good and the lovely snow everywhere was slippery, so I abstained. Next time! It is quite something to travel to the iconic places in the world, and discover that they are in fact larger than life and not small enough to fit on a license plate (which isn’t surprising but I never appreciated how big Delicate Arch would be- I’m on the far left to scale!). It’s quite something else to do it in winter, when the thousands of daily visitors are replaced by a few dozen so you discover the solitude of the desert in spectacular places. The snow is more a lovely decoration for it all.